According to Mississippi State University, pole beans tolerate hot weather better than bush varieties and produce beans over a longer period during the growing season. Lower the risk of disease in pole beans by planting disease-resistant varieties and placing a trellis structure around the plants to keep them off the ground. Plant pole beans once the soil warms above 60 degrees F to reduce the risk of a fungal disease infection from excess moisture during germination. Pole beans varieties are susceptible to the bean mosaic virus, which is present in three strains. A plant infected with the bean mosaic has the symptoms of stunted growth, dried shoot tips and puckered or dying leaves. Bean mosaic spreads to bean plants by aphids landing on the leaves. The best treatment is to remove and destroy infected plants prior to winter. Pole beans are susceptible to the rust fungus, which presents the signs of red-colored dust spots on the underneath side of leaves and on bean pods. The fungus spreads through wind and rain and is able to travel long distances. Remove and destroy infected plants to prevent a re-occurrence the following year since rust overwinters on diseased foliage. According to Cornell University and Mississippi State University, Blue Lake, Kentucky Blue Bean and Dade pole bean varieties are disease-resistant varieties. Blue Lake produces a long, meaty bean pod that is good for eating fresh or processing. Kentucky Blue Bean produces long, straight pods with good flavor for fresh eating. 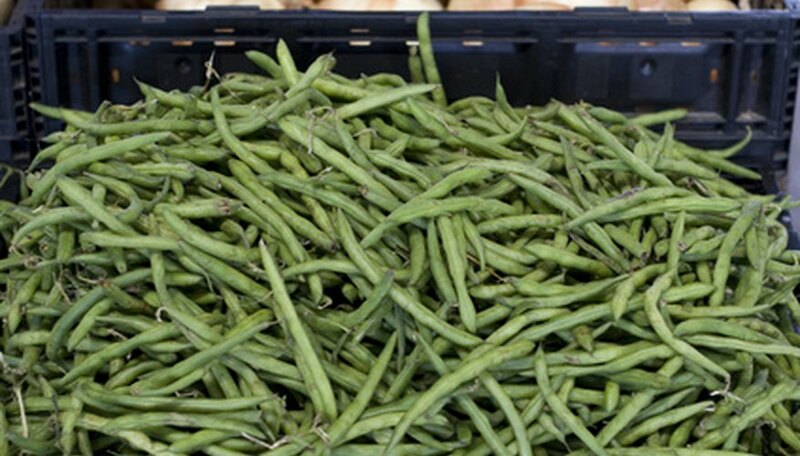 Dade pole beans are a heavy-producing variety with long, fleshy pods that mature early. Plant the pole beans in a well-draining soil that has a pH of 6.0 to 7.5. Add 3 inches of organic matter to the soil prior to planting to increase the nutrient value and water-draining ability. Check the soil pH each year and make amendments with ground rock sulfur to lower the pH or limestone to raise the pH. Making soil amendments each year creates a growing environment for healthy plants. Do not plant pole beans in an area where diseased foliage remained over the winter months. Provide support trellis to pole beans in the form of poles strung with twine or wire or trellis fencing. Train the runners up the trellis to keep the plants off the ground to increase air circulation around the plants and lower the risk of fungal disease. Provide supplemental water to the garden soil to keep it evenly moist throughout the growing season. Allowing the plants to wilt or dry will lower their productivity and health.